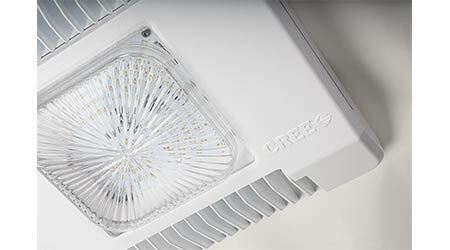 Cree Inc. continues to set performance and efficiency records with the new 20,784 lumen CPY-20L LED canopy luminaire. Delivering a remarkable 143 LPW at 5700K, the newest Cree CPY Series LED product offers even better light experiences and lower operating costs. The result is increased visibility and traffic to outperform existing LED and metal halide (MH) options as the ideal lighting solution for safer and more appealing petroleum stations. The entire CPY Series is also available at 4,000K, and comes with Cree’s industry-leading 10-year limited warranty. There are two optics choices, a flat or prismatic drop lens to meet the visual, as well as the vertical and horizontal illumination performance needs of a typical canopy application. The integrated driver within the canopy housing further simplifies installation, reducing installation time and cost.